The sight of Gunung Panti comes into view when one travels to Kota Tinggi Waterfalls. It beckons, inviting the adventurous to climb it. It peaks at an elevation of 485 meters. At a certain angle when viewed as one travels along the road, it appears to be capped with a huge boulder and the profile indicates a near vertical face on the left edge. To access the base of this hill, drive from Kota Tinggi town towards Air Terjun (local malay word for ‘waterfall’). There are sufficient road signage to point you in the right direction. Four miles out of Kota Tinggi town is a small village, Kampong Batu Ampat. Proceed straight on keeping a look out for signs that say Äir Terjun or Kota Rainforest Resort. The road in, is on the right, 50 meters before Kota Rainforest Resort which is approximately 8km from Kampong Batu Ampat. 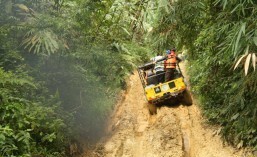 This dirt road that leads to the base is half a km long and on arrival you are greeted by a sign that says Hutan Simpan Panti (Panti Forest Reserve). Just follow the trail from this point onwards and you are on the right track when you cross a small stream bridged by a half sunken log. The trail is clearly visible but unmarked and mostly runs along a ridge. The well worn trail is rutted from water erosion but is clear of underbrush. The forest floor is leave litter and offers good visibility. Keep a look out for leeches. The peak is indeed a rock face and ropes are in place for the short climb. Nature’s garden await you at the peak and your reward is a 360 degree view. The peak can be cloud covered and if a lightning storm brews, descend for your own safety. A light raincoat is essential to keep you and your day pak dry. Allow 2.5hrs for the climb and 2 hrs for the descend. Level of difficulty : Moderate.